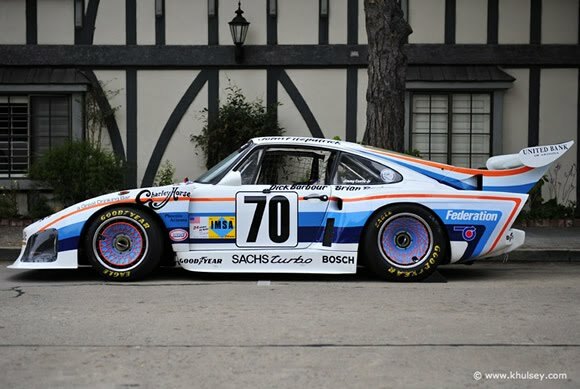 A great side shot of the Porsche 935 shows just how radical this car was in 1980. With such huge horsepower hanging behind the back wheels Porsche needed to use every trick in the book to keep the back in control. Big turbo, lots of lag, 800hp and mechanical fuel injection made the cars crowd favourites bellowing huge flames on the overrun. The 935 was a very winning car. Wikipedia says that of the 370 races a 935 was entered in 123 were won. Amazing feat in a car that they had to change the rules on so other makes had a chance. The beautiful shot above is by Kevin Hulsey.